After the arrival in Geneva of the Cayman GT4, we were looking forward to applying the same recipe on the Boxster. Here is the Boxster Spyder, which is offered in passing a new hood. 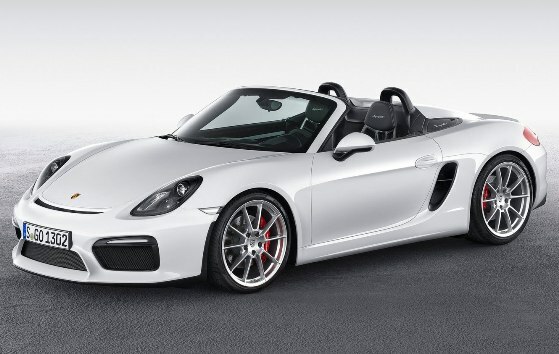 A little more than five years after the first of the name, the new Boxster Spyder comes therefore enrich the range of the roadster, which thus contains 4 versions, Boxster, Boxster S, Boxster GTS and Boxster Spyder. The latter is the most efficient but also the lightest. The recipe is very similar to that of the Cayman GT4, as found in the Flat6 3.8L engine version, but which requires hierarchy, merely 375 hp against 385 in the coupe. New settings of suspension, body lowered by 20 mm, larger brakes from the 911, bucket seats, removal of some comfort equipment (air conditioning, navigation …). With the final 30 kg less than the Boxster GTS. Compared to the 2009 Boxster Spyder, Porsche uses the principle of the double bubble at the back, but falls short in the radical side. This first Boxster Spyder was content with 320 hp, but especially gained 80 kg to simply 1275 kg. Thanks largely to a totally removable roof, and impractical. Porsche has therefore reviewed its copy, sacrificing the purity on the altar of the satisfaction of the majority of customers, and keeps a real hood, handling largely manual (the ejection of the housing remains electric). Both attachments added to the rear maintain the illusion in terms of style. With the most generous power, and despite a less drastic weight loss program, it displays 0 to 100 km/h in 4″5 (4″ 4 for the Cayman GT4, 4″8 for the 2009 Spyder), and a maximum speed of 290 km/h.